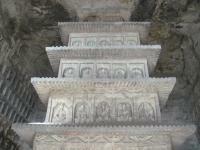 The Yungang Grottoes are excellent examples of Buddhist cave art, dating from the 5th and 6th centuries. They are located near the city of Datong in the Chinese province of Shanxi. The site stretches about 1 kilometer from east to west, and holds 53 caves with 51,000 statues. Yungang is a relic of the Northern Wei Dynasty (386-534) of the nomadic Toba people. They recruited 3,000 monks from along the Silk Route to turn Buddhism into their state religion. Caves 16-20 (Five Caves of Tan Yao, where the Wei-rulers were depicted as living Buddhas). Caves 1, 2, 3, 5-13 (more varied and Chinese in concept). Caves 4, 14, 15, 20 and the rest (smaller caves). During these phases, the 'foreign' Indian Buddhism turned into a Chinese folk religion. In 494, the Wei moved their capital from Datong to Luoyang and the Yungang Grottoes slowly fell into decay. The caves used to be protected by wooden temple buildings, but most of them burnt down. Many of the artwork was stolen in the early 20th century and now resides in museums and private collections around the world. Dusty and dry Datong sees a fair number of western visitors due to its location relatively close to Beijing and because it's the first stop in China of the Transmongolian Express. 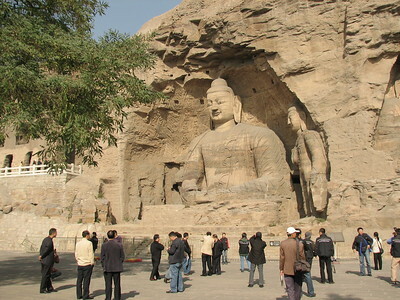 This medium-sized city has a couple of sights, of which the Yungang Grottoes are the most worthwhile. Bus 3-2 plies the 15 km from the train station and the city center to the grottoes. It's a bit difficult to see the carvings in their right chronological order. After entering, you end up in cave 6, which is one of the most brightly painted and represents the 'Chinese' phase. Even the ceilings are full of little details. The neighbouring caves also are colourful and lively, like early versions of the Dazu rock carvings. Walking westwards, I arrived at the five caves of the first phase. These are huge, solemn Buddha statues looking out from a window on the second floor. When you walk into the cave, you only see their legs. Finally, I walked back to the eastern caves (1-5). Be sure not to miss these ones. Especially Cave 3 is interesting, as it is the largest cave of all. There are only 2 statues inside, but you can walk inside and enjoy the play of sunlight and shade. My visit lasted about 2 hours, enough to take in all major caves in detail and walk around once more to take it all in from a distance. After having visited Dazu and Longmen, I think Yungang has a good mix of the features of those two. I'm still not fed up with the Buddhist rock carvings and looking forward to visit Chinese Buddhist rock art site number 4: the Mogao Caves. After Wutai Shan, I continued my Shanxi journey to the city of Datong, one of the ancient capitals of China and where my second world heritage site of this trip, Yungang Shiku or Yungang Grottoes which roughly translated as cloud ridge caves located. Before coming to Datong, I had heard many reports on how dusty and ugly city was, but even prepared to be open minded, Datong was quite exactly what I heard, and the worst of all was its smell, whole city smelled like a burning coal. Since the grottoes were almost 20 kilometers from the city center, I decided to hire a taxi for whole day to take me there. My driver took me pass a few large coal mines, then he turn right in one junction and use a very new road that cut though a truly waste zone of nothing, and then suddenly I was in front of the large dusty construction site and with surprised the driver told me that "we finally arrived Yungang Shiku!" Reluctantly to admit, Yungang were the worst World Heritage Site in terms of its location as it was in the middle of ugly and dusty industrial coal mine complexes. After paid a reasonable price of 60 Yuan for a ticket, I entered another wonderland of hundred of grottoes. In my opinion, Yungang was one of the greatest laboratories of art in the whole world; this was the place where for almost 70 years ancient artists acted like scientists who made experiments to assimilate South and Central Asian arts into local arts which later developed into what we thought of mainstream Chinese arts were. Unlike Longmen where I visited four months ago, Yungang was built by sandstone which made all these countless blondish Buddhist statues looked seedy and more fragile than the one in Luoyang. Although I was not favor the Northern Wei Buddhist style as you can see in my Longmen review, I had to admit that the colorful interior rock cravings in many caves of Yungang especially in caves 5 and 6 were truly magnificent compared to the colorless Longmen, I was not surprised to see why many people preferred to appreciate Yungang more than Longmen. So what was my final verdict for Yungang, As I written Yungang was the greatest art laboratory I have ever seen and highly appreciated, in such a short period of time, the genius of artists were clearly testified and the result of theirs experiment were invaluable; however in truly typical of many great laboratory which always located in ugly industrial zone, Yungang was by far suffered the environmental issues beyond my imagination which quite ruined whole visiting experience. Later I had been informed that Yungang was under major redevelopment, the new road I used was the road that designed to bring tourists to Yungang directly bypassing many ugly coal mines, and the construction site I saw will be a future tourist complex. The grand plan was intend to transform this dusty land to be a scenic landscape, so I just maybe visited this site too early to make any comments. My 4th and final review of Buddhist caves/grottos on the UNESCO list in China has reached Yungang near Datong (ref reviews of Mogao, Longmen and Dazu). This too was visited by me as early as 1978. However for some reason or another it has registered less in my mind than Longmen, visited just a few days earlier. Perhaps the novelty of looking at Buddhist statues had worn off or perhaps I was still recovering from having, earlier that morning, visited the “Anti-Nuclear Tunnels” at a cake factory in Datong! There we had been told that Mao Tse Tung had said in his teachings on preparation for war and natural disasters “Dig tunnels deep, stock greens (vegetables?) everywhere and never seek hegemony” (there is no answer to that!). So the 335 workers in the factory had spent 4 years working in their spare time without payment to dig 1500 metres of tunnel. These they showed us with understandable pride. They had created kitchens, dormitories, meeting rooms and a “cleaning room” for nuclear, chemical and biological agents - and still had plans for more!! Somehow the futility of this human endeavour cast a shadow on the results, albeit more beautiful, resulting from effort, but possibly equally futile, spent carving out and painting over 50000 Buddha statues in nearby cliffs at Yungang!! There our guide had told us that the temples were the result of the “Exploiting classes of former rulers who used Buddhism to imprison people’s minds” - but this seemed to apply similarly to what had been going on at the Cake Factory in relation to the Communist leaders! Nevertheless I did note in my diary that the temple had “magnificent wall paintings and statues” (photo) – but you will have to decide yourself whether the sight of thousands of Buddha statues is worth the c 7hr trip out to Datong from Beijing! At that time Datong was a very grimy industrial city and the following day we were treated to a trip down a coal mine. Coincidentally “The Economist” of May 13 2005 contains a review of present day Datong. It appears that the very same coal mine we visited 27 years ago has started taking tourists as visitors in the hope of tapping into the large numbers who go to see Yungang! If you do go please try to find out what has happed to the tunnels at the cake factory. Perhaps they too should be inscribed on the UNESCO list as they could be said to meet eg criteria ci, ciii and civ!! There are certainly many less worthy/amazing structures on the list.